A lithograph is an original print . 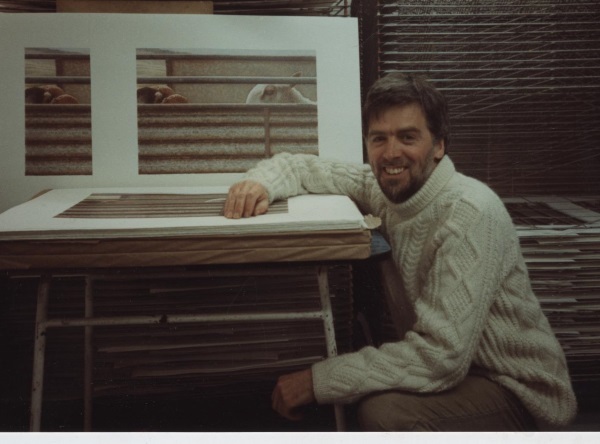 . . in the same way that an etching or silkscreen or even a potato cut is an original print. It is not a copy of a painting. The great majority of my lithographs since 1990 have been made by drawing onto a transparent plastic film (Trugrain) on a light box. This drawing might be made with any traditional drawing material eg pencil or, as in the photograph of 'Climb' to the left, Chinese ink. An advantage of the Chinese ink is that, should I want to get rid of the drawing, it can be erased by simply washing out with water. When I am happy with the drawing I will take it down to the print studio and put it on the exposure unit, place a small light-sensitive aluminium plate (a Toray Plate) over it and then expose the plate to ultra violet light though the drawing. At this stage I will usually make a number of these small test plates with different exposures. The more the plate is exposed to ultra violet light the more the lighter areas of the drawing disappear - giving the print greater contrast. The less the plate is exposed to ultra violet the more the greys are retained. When I've decided on the appropriate exposure time I will go ahead and expose a larger plate over the complete drawing. This plate is then developed and ready to be placed on the press and inked up - see photograph to the left with Skein (v). 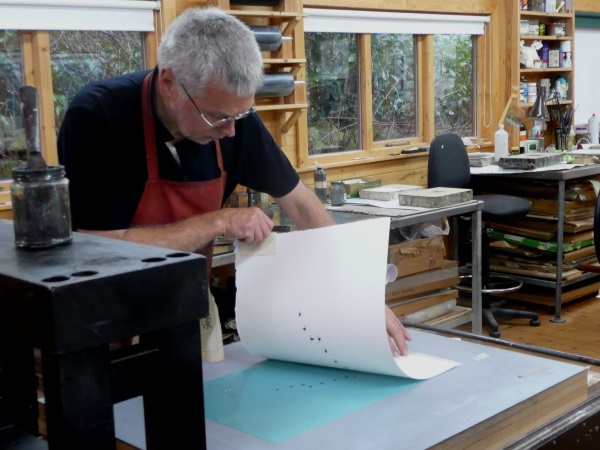 Paper is then carefully laid over the inked up plate and run through the press. Then . . . the moment of truth as you lift the paper and see the print. 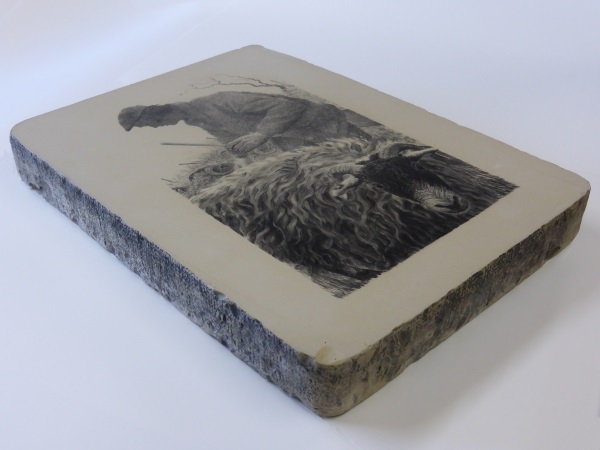 The word lithograph means stone drawing. Historically, in fact since 1798 when Alois Senefelder discovered the process, artists have made lithographs by drawing on Bavarian limestone (see my lithograph 'Marking' - drawn on stone - to the left) and, more recently, zinc plates. The stone is ground down using a levigator and carborundum grit (see photographs). This gets rid of the previous drawing and sensitises the surface of the stone to grease. 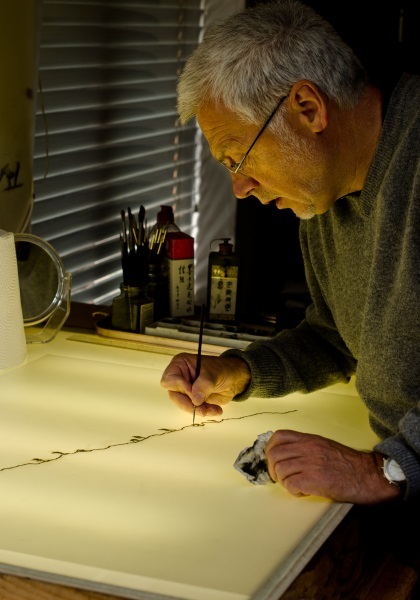 The artist then draws onto the stone with a greasy crayon or greasy ink. This drawing is then given an 'etch' of gum arabic and nitric acid which is brushed over, altering the surface of the stone. The image areas will now attract ink and the non-image areas will repel the ink. When the etch has dried, the stone is placed on the printing press and the black drawing materials are washed from the surface. All that remains is a trace of the image. The image is then re-established using printing ink. 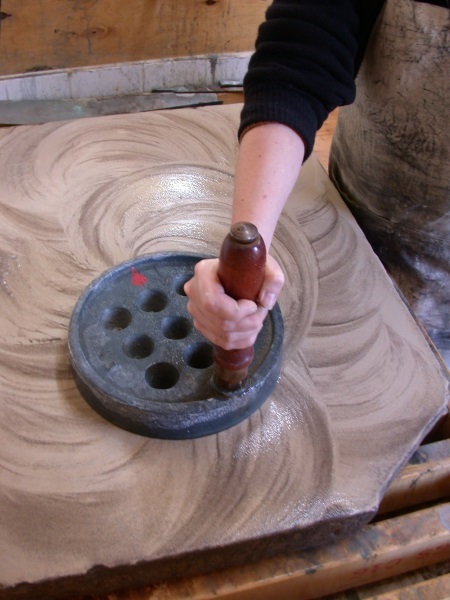 The surface of the stone is kept damp and the ink is applied, using a leather roller. Proofs are taken at this stage to check the image is working. The stone is then given a second etch to stabilise the image. The stone is then ready for printing. 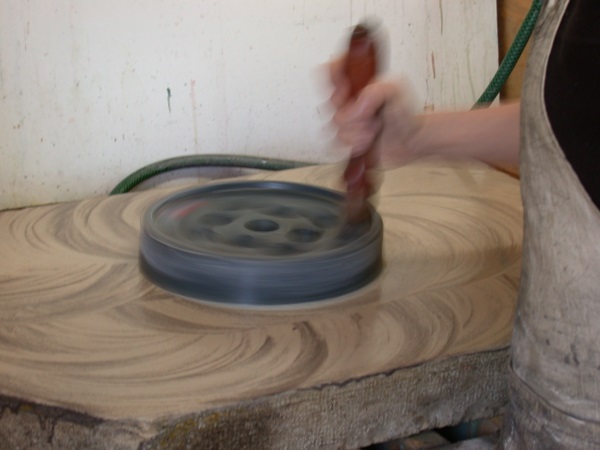 Using a roller, lithographic ink is applied to the damp stone. Paper, cut to size, is dampened and placed over the image, and this in turn is covered by a tympan - a sheet of plastic which allows the stone to slide under the pressure bar of the press, applying pressure to the stone and paper. 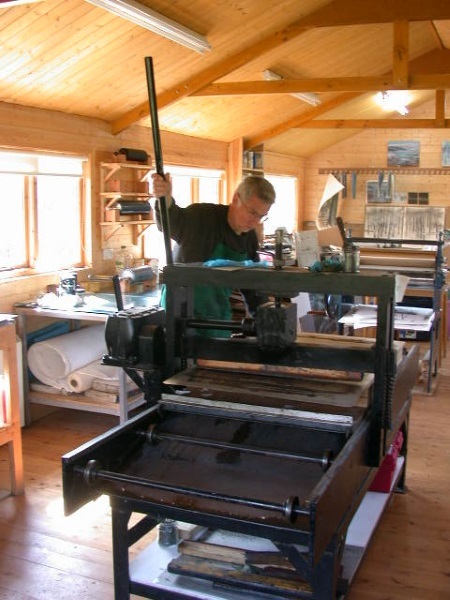 An edition of prints can then be printed in this way. Each is signed and numbered before the image on the stone is erased, and the stone reused.. Normally one stone is used for each colour to be printed. A tracing is made of the original drawing and this is then transferred to each subsequent stone. Also, exceptional care is taken to place the paper, to be printed on, in exactly the same position on each subsequent stone (registration). The process described above uses a direct press and stones. In the case of offset printing, the image is transferred on an offset press from a zinc plate to a rubber blanket and then onto the paper. 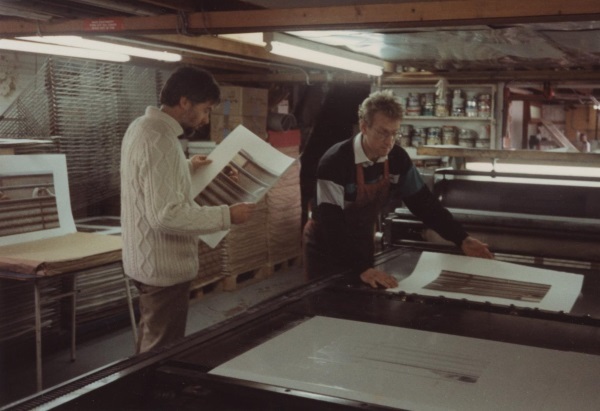 The photograph to the left shows 'Take Stock' being printed in 1989, using a zinc plate on an off-set litho press at Lowick House Print Workshop.